Convicted sniper Lee Boyd Malvo, who is currently serving 10 life sentences, could face a new trial, according to Prince William County prosecutor Paul Ebert. 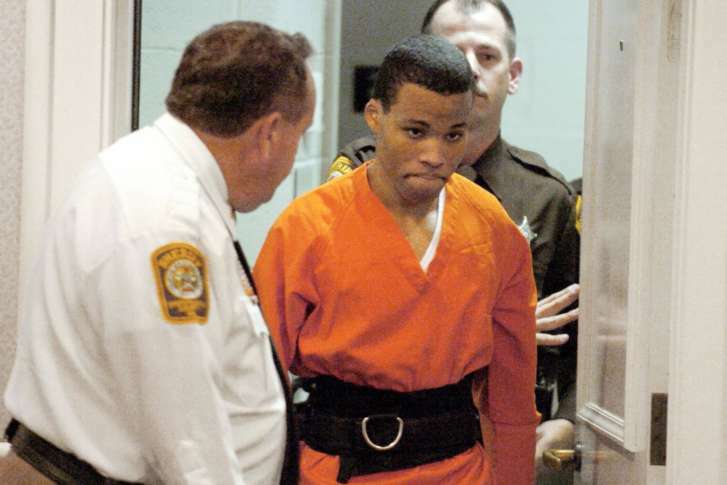 WASHINGTON — Soon after the U.S. Supreme Court ruled capital punishment for juveniles was unconstitutional in 2005, Prince William County prosecutor Paul Ebert announced he would not prosecute Lee Boyd Malvo for the 2002 sniper murder of Dean Harold Meyers. Now, that a federal judge has ordered Malvo be re-sentenced for four life sentences in Virginia, Ebert says Malvo could stand trial in the killing of Meyers, who was killed instantly as he pumped gas at the Battlefield Sunoco station on Sudley Road, in Manassas. Last week’s ruling by U.S. District Court Judge Raymond Jackson vacated Malvo’s life sentences in Virginia, and ordered he be resentenced in Chesapeake for the Fairfax County murder of Linda Franklin, and in Spotsylvania County for the murder of Kenneth Bridges and the wounding of Caroline Seawell. Malvo received two life sentences in the Franklin murder, and one each in the Spotsylvania shootings. Virginia Attorney General Mark Herring has not announced whether he will appeal the ruling. “We’re still looking at all options, including appeals, to make sure this convicted mass murderer serves the life sentences he originally received,” said Herring’s spokesman, Michael Kelly. In 2012 the Supreme Court ruled mandatory life sentences without the possibility of parole were unconstitutional for juveniles. In 2016 the court determined the ruling should be applied retroactively. Malvo’s attorneys, Craig Cooley and Michael Arif, argued that since the jury was only given two options in 2004 — the death penalty or life with no chance of parole — the judge’s sentencing was mandatory. Ebert successfully prosecuted sniper mastermind John Allen Muhammad for the Meyers murder, in a trial that was moved to Virginia Beach because of pretrial publicity. Muhammad received the death penalty, and was executed in 2009. On June 15, Malvo’s attorneys will argue for a new sentence in Montgomery County Circuit Court, where he pleaded guilty to six murders, and was sentenced to six life sentences, with no chance of parole. Montgomery County State’s Attorney John McCarthy, in a court filing, argues that Malvo’s life sentences were not mandatory. “Under the plea agreement, the court had the discretion to impose any sentence authorized by the first-degree murder statute,” wrote McCarthy, which includes the possibility of parole. Former Maryland Attorney General Doug Gansler orchestrated Malvo’s 2006 plea arrangement for six murders, when he was the Montgomery County prosecutor. Gansler does not believe Malvo will need to be resentenced in the state. All prosecutors — former and present — say there is little chance that Malvo will ever be released from prison. “The only possibility that currently exists is if the judge in the Virginia re-sentencing gives something less than life-without-the-possibility-of-parole, and Lee Malvo was somehow paroled in Virginia, he would immediately be sent to serve the rest of his time in Maryland,” Gansler said. That marks a change for Ebert, who earlier insisted Malvo spend his time in a Virginia prison. In 2006 Ebert and now-retired Fairfax County prosecutor Robert Horan rejected Gansler’s suggestion for a global plea in which Malvo would plead guilty to shootings in Maryland, and D.C., as well as earlier shootings in Louisiana, Alabama, Georgia and Washington state. “There’s these other murders that we now know about because of our interviews with Malvo,” said Gansler, referring to several meetings in his office, in which the younger sniper detailed the shootings. Ebert and Horan opposed the global plea, saying a murderer shouldn’t dictate his accommodations. Gansler said the information gleaned could help add insurance to keep Malvo behind bars, if jurisdictions wanted to incur the expense to prosecute him. “There are these other murders that he has not been prosecuted for around the country that he could also be charged with,” Gansler said. While other sniper shootings could theoretically be prosecuted, two non-fatal shootings in Prince George’s County, Maryland, won’t be. In 2002, then-State’s Attorney Glenn Ivey decided not to prosecute Malvo or Muhammad for the wounding of Iran Brown, who was 13 when he was wounded outside Benjamin Tasker Middle School, in Bowie. In addition, Paul LaRuffa was shot outside his restaurant in Clinton. In 2006, Malvo’s Prince George’s County charges were officially dropped. “It remains Mr. Ebert’s prerogative to prosecute, said Craig Cooley, one of Malvo’s Virginia lawyers.